Efforts are continuing to raise funds to pay for major repairs to the pier. Even relatively minor, but essential repairs each year cost at least £10,000 or £20,000. This has all to be raised by the village since the pier is owned by us and is not eligible for local authority support. Your purchases and donations during the preview at the Dolphin Gallery during the Gala have already raised £289.72 towards these costs. We hope to raise a further £5000 through sale of the calendar made up of the 12 pictures that folks voted for during the Gala. We’ll be previewing these online very shortly and the calendar will be on sale in time to meet the deadlines for posting overseas for Christmas. Looking further ahead and as part of the ongoing fundraising, plans are in hand for a Christmas Craft Fair in the Community Centre on Sunday 10th November. 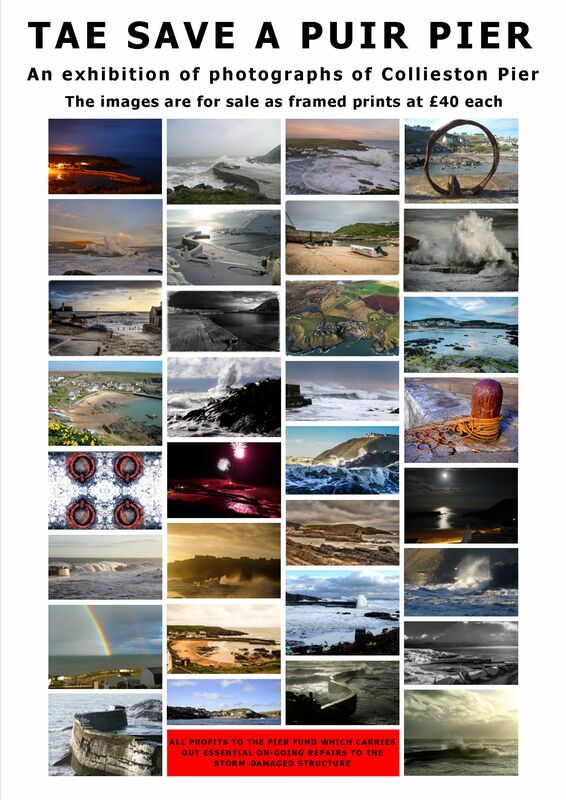 The “Tae Save a Puir Pier”, based on your top twelve pictures from the exhibition will be on sale at the Fair. More details nearer the time. who might be affected and who are not online, can you please let them know.